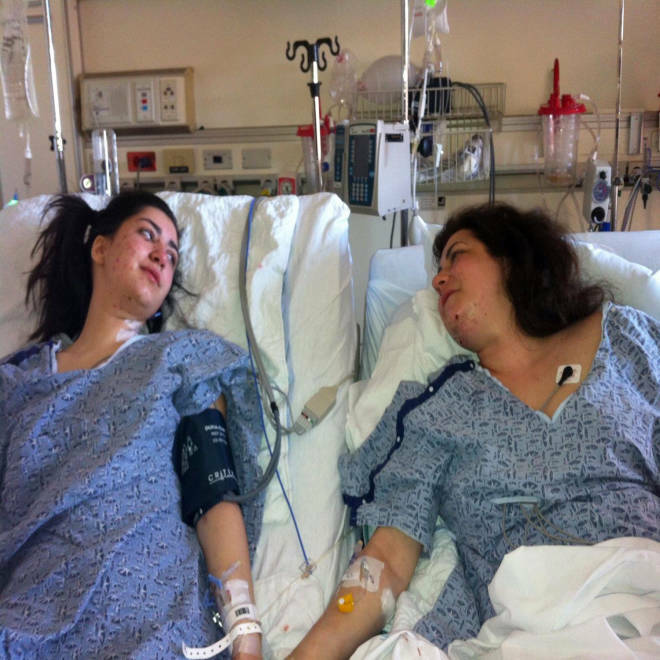 Celeste Corcoran, 47, right, and her daughter, Sydney Corcoran, 17, were both hospitalized at Boston Medical Center after being injured in the Boston Marathon bombing. Celeste lost her legs below the knee and Sydney was badly injured. It will be weeks, at least, before Celeste Corcoran is anywhere near ready to think about artificial limbs. The 47-year-old Lowell, Mass., hairdresser lost both her legs below the knee in Monday’s deadly bomb blasts in Boston, which also severely injured her 17-year-old daughter, Sydney. But when Celeste and the 16 others who reportedly lost limbs in the attack are ready, experts say they will find that the options for returning to full and active lives have never been better. For now, just getting through multiple surgeries has been tough, said Carmen Acabbo, Celeste's sister, a runner who was the reason the women were at the Boston Marathon finish line, where two bombs left three people dead and more than 170 injured. "It just hits you, like, life will never be the same, but she can still hug me," Acabbo, 43, told NBC's Rock Center with Brian Williams. "And I still have her. She's my very best friend and I'm just so thankful to have her in whatever capacity that I do." The techniques and technology for addressing amputations -- and the prosthetics that follow –- have advanced by leaps and bounds in the past 10 to 15 years, experts say, spurred both by devastating demands of America’s long wars in Iraq and Afghanistan and eager private firms that have responded to the call. “When you look at war from a medical perspective, as bad as it’s been for the populations involved, it has led to advances for the patients served,” said Dr. Michael Bosse, an orthopedic trauma surgeon and retired Naval Reserve captain who heads the Major Extremity Trauma Research Consortium, which is aimed at improving treatment for military and civilian victims. In the past, conflicts from the Civil War to Korea and Vietnam sped innovations in medicine that included development of ambulance corps, blood transfusions, mass-produced antibiotics and emergency helicopter evacuations. Similarly, a decade that produced more than 1,500 military amputees and scores of other catastrophic injuries caused by IEDs -- improvised explosive devices -- has honed everything from innovations in surgical techniques and limb management to artificial limbs that are lighter, stronger and more comfortable than ever, experts say. “The amputees and the high visibility have certainly helped fuel investments,” particularly from federal sources, said Peter Thomas, a Washington, D.C., amputee and lawyer who specializes in disability law. The victims in Boston may be able to choose from an array of prosthetic devices that can be customized to personal need, with artificial joints powered by microprocessors, titanium parts and carbon fiber feet that are able to absorb and adjust for the impacts of walking, running -- even jumping and climbing. Because of the military interest and investment, amputees like retired Army Sgt. Maxwell Ramsey of Elk Grove, Calif., have been able to use limbs like the X3 prosthetic leg made by German manufacturer Otto Bock. Sgt. Max Ramsey lost his left leg below the knee in Iraq. He now uses a high-tech artificial limb, one of 35 in the world. Here, he talks to high school kids at Upland High School in California. Ramsey, 43, who lost his left leg to an IED in Iraq in 2006, says the waterproof, dust-proof and corrosion-free limb probably cost “north of $50,000” when he received it -- but that was before it was commercially available. Or, perhaps they’ll opt for a bionic ankle made by iWalk, a Bedford, Mass., firm that says the device allows amputees to walk with the same speed and the same effort as non-amputees. Many new amputees are interested in high-end devices with a full range of bells and whistles, said Bosse, the orthopedic trauma surgeon. That’s especially true once new amputees realize that it’s not the device that determines recovery, it’s the person. Whether a person has what experts describe as “self-efficacy,” the ability to rebound from the loss of the limb, is critical to moving forward, Bosse said. Researchers are compiling evidence about how to better help people cope with depression, post-traumatic stress and other psychological conditions that often accompany amputation. In the meantime, it’s important to offer the Boston victims both encouragement and compassion, said Thomas, 49, who lost both of his legs in a car accident at age 10. Speculating too soon about whether the survivors will be running on high-tech artificial legs may skip over necessary stages of grief. Already, though, family members say Celeste Corcoran is displaying impressive resilience and strength. When she saw her sister, she said: "I can't believe I didn't see you finish this thing," Acabbo said. "She just found out that she lost both legs. And she said that." That kind of attitude bodes well for the future. The family already has received an outpouring of emotional and financial support, in part from a fundraising website. And they'll continue to push forward, Acabbo said. "I was like, 'Celeste, like, we have your marathon next,'" Acabbo recalled, describing her first visit with her sister in the hospital. "I am gonna be with you every step of the way to get you back on your feet and to be able to conquer this."